(Nanowerk News) Proximity effects in hybrid heterostructures, which contain distinct layers of different materials, allow one material species to reveal and/or control properties of a dissimilar species. Specifically, for a magnetic thin film deposited onto a transition metal oxide film, the magnetic properties change dramatically as the oxide undergoes a structural phase transition ("Coercivity enhancement in V2O3/Ni bilayers driven by nanoscale phase coexistence"). The hybrid between a simple magnetic material and a transition-metal oxide provides a “window” to understand the metal-to-insulator transition and offers dramatic tunability of magnetic properties. Potential applications are envisioned in the fields of information storage and power transmission. 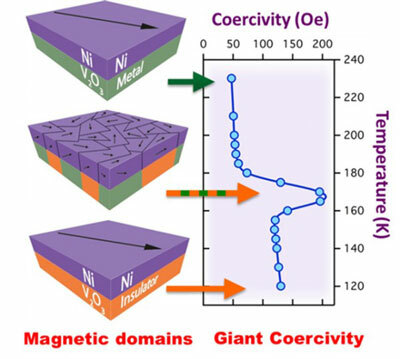 The magnetic coercivity, the resistance to change in the orientation of the magnetic domain structure, for nickel (Ni) was shown to strongly depend on the crystal structure of the underlying oxide (vanadium oxide). The maximum Ni coercivity occurs at the peak of the oxide’s metal insulator transition. Novel effects are increasingly being discovered when dissimilar materials are in contact (“hybrids”), often resulting in altogether new phenomena, materials with useful functionalities, or the ability to sense or control important material properties. The focus of this investigation is a hybrid material consisting of a thin nickel film on a vanadium oxide substrate; this hybrid material exhibits magnetic properties unlike any other magnetic material. In this case, the magnetic coercivity (defined as the resistance to a change in the direction of the magnetic fields for a ferromagnetic material) of the nickel reveals insights concerning the transition of the vanadium oxide from being an electrical conductor to becoming an insulator, called the metal-insulator transition (MIT). In turn, the MIT can be used to control the coercivity of the nickel. The vanadium oxide MIT is coincidental with a structural change at a well-defined “transition” temperature. At the thermal midpoint of the transition, crystallites of both phases coexist in equal portions, resulting in maximal structural entropy. The resulting inhomogeneity of the oxide structure causes stresses in the nickel (or other magnetic) film deposited on top. This provides a strong link between the nickel coercivity and the disorder in the oxide. The coercivity is low when the oxide is structurally uniform (above and below the MIT) and high when it is maximally disordered in the middle of the transition. The magnetic properties of nickel therefore provide a window into the MIT process. In turn, the MIT allows dramatic nonmagnetic control of the coercivity, which changes by several hundred percent within a narrow 10 K temperature range, unlike any other known magnetic material. Potential applications have been envisioned in two important, disparate energy related fields: energy driven magnetic recording and self-healing current fault limiters.